PHOTO BY JILL GOSCHE Angela Best (right) prepares to leave the courtroom with Sgt. David Pahl of Seneca County Sheriff’s Office Tuesday afternoon. A Republic woman admitted Tuesday afternoon that she committed 12 burglaries over the past three years. Angela M. Best, 45, is the wife of a Seneca County Sheriff’s Office deputy. One of the burglaries was committed at a fellow deputy’s home, and another was committed at a deputy’s daughter’s home, according to Seneca County Prosecutor’s Office. Best waived indictment and proceeded with a bill of information charging her with 12 counts of burglary, all second-degree felonies. Seneca County Common Pleas Court Judge Michael Kelbley sentenced Best to four years in prison on each count and ordered the sentences served concurrently. He granted credit for two days served. Best would be eligible for judicial release after serving six months in prison. 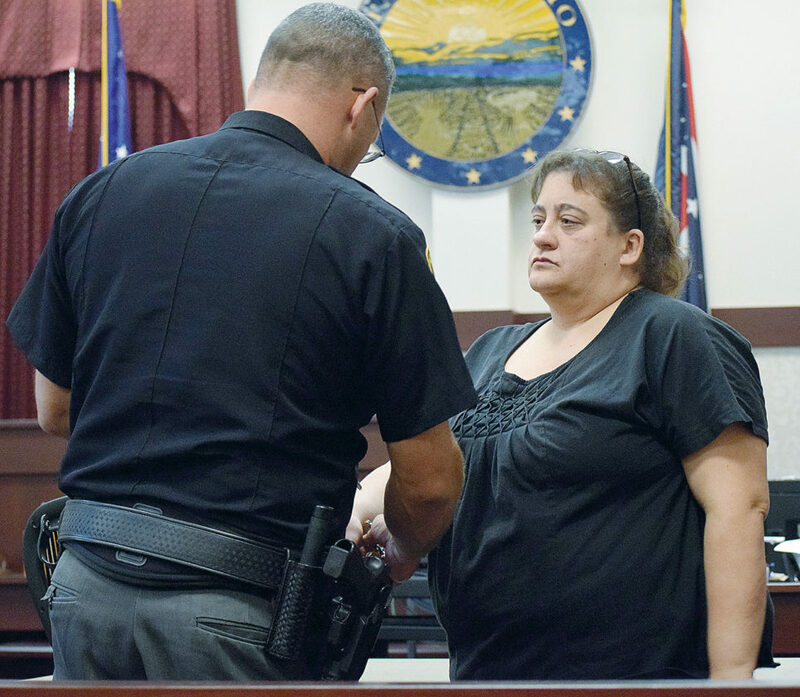 Seneca County Prosecutor’s Office agreed to remain silent about a judicial release motion once Best serves a year in prison, with the condition that she complete a community-based correctional facility program. Seneca County Prosecutor Derek DeVine said Best suffers from an addiction to pain pills. As a result, she victimized members of her community who were friends, he said. When confronted by Detective Sgt. Kevin Reinbolt of Seneca County Sheriff’s Office, Best admitted to the offenses contained in the bill of information and told him there could have been more, DeVine said. Prescription medication was the only thing stolen during the burglaries, he said. Best’s attorney, Matthew Exton, said Best was having a difficult time Tuesday. She had started to use Percocet pills obtained through her doctor and became addicted to pills over time, he said. It had taken a lot for Best to come to terms with the consequences of her behavior, and she was remorseful, Exton said. After the hearing, DeVine said some of the victims were home when Best committed the burglaries, while most were not. Reinbolt said Best knew every victim, and the victims were friends or acquaintances. “None were strangers,” he said. Reinbolt said Best’s husband, Richard Best, had no knowledge of what she was doing when he either was not at home or sleeping. Best works the midnight shift and sleeps during the day, Reinbolt said.